Whilst this unusual plot of land nestled off the southern tip of Spain is not Spanish, it is worthy of a mention due to its closeness. Gibraltar is a British dependency and a world famous tax-haven. Once a military stronghold although the military presence has now been scaled down. The RAF has maintained a base at the airport. It is a tourist haven that attracts many thousands of visitors all year round. Despite the small area of land that Gibraltar occupies (about 2 square miles), it has many points of interest for the tourist. Once over the frontier from Spain, which can be a trial, especially in the summer season, (passports required), there are companies that run tours of the rock and all the sights. The tours last approx. 1 1/2 hours. There is also a cable car that runs to the top of the rock. This starts at the Botanic Gardens and finishes at the Ape's Den. The rock tour includes the Caves of St.Michael with all its glorious stalactites and stalagmites, where concerts are still held, deep within the rock, the Siege Tunnels with 32 miles of underground passageways inside the rock, a Moorish Castle, last rebuilt in 1333 that stands perched on the edge of the cliff. 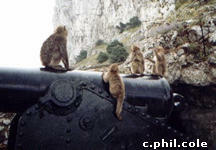 Gibraltar is also the only place in the world where Barbary Apes live wild. These tail-less monkeys have lived on the rock for centuries and are amusing to all who see them. If you drive your vehicle up the rock, the price is £10 plus £2 per person. [2010/11]. Pictured above are the apes. WARNING ! Do not feed the apes. There is a huge fine which will be imposed if you are caught. watch your personal belongings as the apes will steal anything they can get hold of. Bags and sun glasses are particularly attractive to them, as are carrier bags. See our rock tour video to see the apes violently fighting. Gibraltar rises to 450 metres at its peak and guards the entrance from the Mediterranean to the wide ocean beyond. The history of Gibraltar is fascinating to say the least. Read the history of Gibraltar here. Pictured below is Gibraltar from La Linea which is the Spanish town where the border crossing is located. At Europa Point you can obtain a clear view of the coast of Africa, about 14 miles away. The view of the rock looking back is beautiful. At Europa point there is an observation point with telescope. Currently the area is being dveloped and a new park is being constructed . The Ibrahim-al-Ibrahim Mosque is located here (see left). It's the most southerly located Mosque in Europe. It was a gift to Gibraltar from the late King Fahd Al-Saud. It took two years to build. 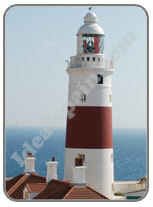 At Europa Point you will also find the Trinity Lighthouse. 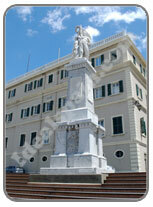 It was built around 1838, instructed by the Governor of Gibraltar, Alexander Woodford. The lighthouse opened in 1841. A crowd of more than 2000 people gathered to see the lighthouse begin operation. It was called trinity Lighthouse beacuse Trinity House was employed to manage it. The lighthouse stands around 50 metres above the sea and the light can be seen more than 27 km away. In 1894 improvements in the lighting were made and a fog horn was added later. It is the only Trinity lighthouse located outside the UK. 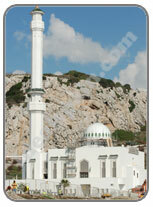 Pictured left is one of the first monuments you will see in Gibraltar. It is located on the right as you cross over the runway. 'Gibraltar - Cradle of History'. It was placed here to remember all the important things in history that have affected Gibraltar. When you arrive at Casemates Square, at the bottom of Main Street, you will find the canon (right). This is a very unusual canon in so much as it was designed specifically to fire downwards from the rock. Casemates Square also features several restaurants, shops and the glass museum and exhibition. 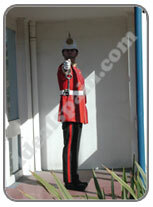 Casemates Square is also the best place to see the changing of the guard in Gibraltar. This square is the largest in Gibraltar and the place that locals prefer to meet. The glass museum in Casemates Square has a demonstration of glass blowing, an information point and a factory outlet. Entry is free. Pictured right is another famous statue in Gibraltar. This one illustrates the evacuees returning to Gibraltar after World War II. It's located close to the port entrance, on North Mole Europort Avenue. Beacause of the military history of Gibraltar, wherever you look you will see remnants from war times. Most street names are based on the military history and many of the original buildings still stand. Pictured left is the guardhouse at the top end of the main shopping street. Opposite the guardhouse is the Convent. It has been the official residency of the Governors of Gibraltar since 1728. It was once a convent of Franciscan Friars, hence its name. The changing of the guard takes place here by the Royal Gibraltar Regiment. Pictured left is one of a pair of heavy brass canons that stand near the Guardhouse. Most visitors have their photograph taken here. The Gibraltar Rock Tour can be done by car, minibus or taxi. The ticket price includes the nature reserve, the caves, the castle and the tunnels. There's also a cable car that runs to the top. The Moorish castle is located on the north-western slope of the rock and was last rebuilt in 1333. The Tower of Homage looks over to the only land entrance to Gibraltar. The Great Siege Tunnels are part of the rock tour and were excavated by artificers of the British Army during the Great Siege of 1779-83. You can wander through some of the tunnels and look out to see through the tiny windows. St.Michael's Cave can be visited as part of the Gibraltar Rock Tour. At around 300m above sea level it is one of Europe's most dramatic grottoes. Regular concerts are held here. The Ape's Den is where you will see the famous Gibraltar Barbary Macaques (Apes). They are probably one of Gibraltars' best known attractions (and the most dangerous). Passports are required for entry into Gibraltar. Once you have passed through the customs and police checkpoint, you will walk/drive past Gibraltar Airport and cross the runway, which is a notorious short landing. The airport is currently having a new terminal built [open 2011]. You can catch the city bus at the border crossing. It's very cheap and takes you right into the town centre. [aprox £1]. Flights to and from Gibraltar Airport include Easyjet, Monarch and British Airways. See airport details here. When a plane takes off or lands, the runway crossing is closed off to traffic and pedestrians. You have to wait at the barriers. It's a great place to see close-ups of planes. Pictured right; The keys to Gibraltar, seen on your left as you cross the border. Pictured left is the City Hall in the city centre. There are three synagogues, several churches and the cathedral. Main Street is the main shopping street. There are hundreds of shops, mostly selling the same items. Electronics, souvenirs and jewellery are reported to be cheap in Gibraltar but we didn't think so. Be prepared to haggle the prices here too, it's quite acceptable. Cigarettes are cheap in Gibraltar (£1.50 per packet, 2010). Alcohol is cheap too except Spanish wines. Pictured above are two more monuments in Gibraltar. Gibraltar has a large port and leisure marinas from which you can take dolphin spotting trips and fishing trips. You can spend British pounds and Euros in Gibraltar. Your pound is best as you won't always get the best exchange rate. There are British banks and post offices in Gibraltar. The police are british. You drive on the right, as in Spain and not as in the UK. Do not break the speed limit. There are regular speed traps. Do not park illegally - the tow truck is always on the prowl and works quickly. There are several pay car parks and they are very cheap and secure. Petrol is cheap. The cheapest place to get petrol is not always the first garage as you enter Gibraltar. Check out the garage at Morrisions supermarket. If you want to see the sights in as little time as possible, take a rock tour on one of the organised trips. They are not expensive and well worth the money. The small minibuses leave from near the border crossing. Quickest way into town and the shops is taxi or one of the city buses. Buses are very cheap and regular. Gibraltar has several sandy beaches that are well cared for and clean. One of the best is Eastern Beach, close to the airport. The beach is long and wide and has good facilities. Other beaches include Catalan Bay, Sandy Bay, Little Bay and Camp Bay on the western side. There are no camping facilities in Gibraltar and trailers/caravans are not allowed over the border. A good place to fly into if you are visiting southern Spain and find Malaga airport too far away or too busy. See more about Gibraltar Airport here.